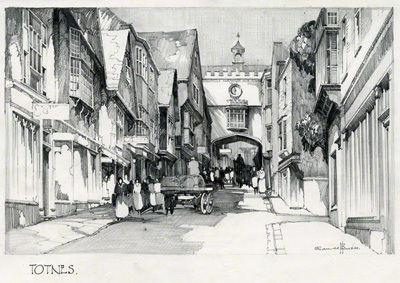 View of the East gate Arch from Fore Street looking towards the High Street. Claude Buckle captures the famous scene in a pencil drawing in all its detail and not for the first time. A railway poster of the Eastgate was made by Buckle in 1933 as well. Its possible that the pencil drawing led to a full scale version being made. Buckle also painted a poster of Buckfast Abbey. Totnes and Buckfast Abbey (both in Devon) are connected by the presence of the South Devon Railway, a 6.64 miles (10.69 km) heritage railway to Buckfastleigh which goes alongside the River Dart. It was previously known as the Dart Valley Railway. The Railway is operated by the South Devon Railway Trust, a registered charity. The world famous East Gate Arch, seen in nearly all professional photographs of the town, was devastated, along with several other properties in the early hours of Sept 14th 1990. Notice that this drawing is of the original building before the fire.